Colors is often regarded as their best work, but for me this is their best album. Amazing flow between the tracks, long winding riffs and runs that make your head spin, great vocals and the finishing track is godly. Fantastic quality vinyl. The vinyl is very heavy weight and are like plates. The album itself is probably one of BTBAM best. I will not trust Victory Records with future vinyl releases. This and my ADTR Homesick LP are not mastered for vinyl and sound very gritty near their runoffs. I feel cheated out of what was originally recorded. It's a shame. i'm being very generous, but this is legitimately much better - as the old friend correctly claimed. weeelllll.....i can place more than a few: crimson, tool, zeppelin, yes, genesis and bjork, together, wrote 75% of the riffs on this disc that i can recognize, but the way the riffs are stolen, spliced and recombined is, while noticeable, largely not a drawback. it works because the sections are so remarkably short that by the time you've placed your finger on what riff they're stealing, they've jumped to the next one - and because it happens to be that i kind of dig most of the riffs, especially when re-interpreted in so disparate a genre as metal as voluminous as this. now, i was talking about the riffs; the lead parts are largely original and a definite upgrade over the first two discs in the sense that he's definitely come out of the box substantially and expanded a bit on the teases of talent that sporadically appear on the first few discs. it is unquestionably the lead work, combined with a slightly more mature compositional style that has moved away from thrash and towards grunge, that has softened me up a bit on them. one of the stronger aspects of the band from the beginning was the production decisions. the guitar tone has changed slightly and i think it's certainly for the better. it sounds like he picked up a treble booster, but he may, of course, have simply played with the eq a bit. the vocals sound....decimated....and that's hard to explain without getting incredibly geeky. it's a sort of compression/limiter effect that destroys all dynamics and comes packaged with cubase. it makes them much more digestible. nonetheless, the problem is still the vocals. i still don't know what the hell he's saying. i can handle the chaotic drum parts in bursts - i do listen to quite a bit of stuff like zorn, you know - and i have no aversion to distortion or heavy music in general. it's really just the screaming, but it's kept to what i'm hoping is a tipping point, enough to maintain an old fanbase but not too much to push away a newer one, or at least the beginnings of a newer one. overall, the guiding force on this disc is unquestionably the prog influence, which probably took a lot of people by surprise, but is a bit more up my alley. if there were ever any questions about the patton influence, they should dissipate after a single listen. they've also expanded a bit further on the shoegaze-y and post-rocky elements on alaska, which is again a genre that is more my cup of tea. the fifth track sounds like a cash register, whereas the last one falls a bit flat. generally, eighteen minute songs are supposed to be substantially more diverse than this one. now, i'm not suggesting that the song is a simple loop repeated for seventeen minutes, it's certainly not; there are a couple of shifts in dynamics, even, but the level of continuity is such that it really is a single, eighteen minute, mostly instrumental jam and consequently not an epic, per se. 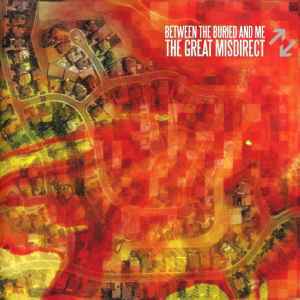 i'll say it again: a second giant step forward for between the buried and me. if they keep walking down the same path, the next one could legitimately be bordering on a substantial, serious piece of music; this could, one day, be viewed as their first record.